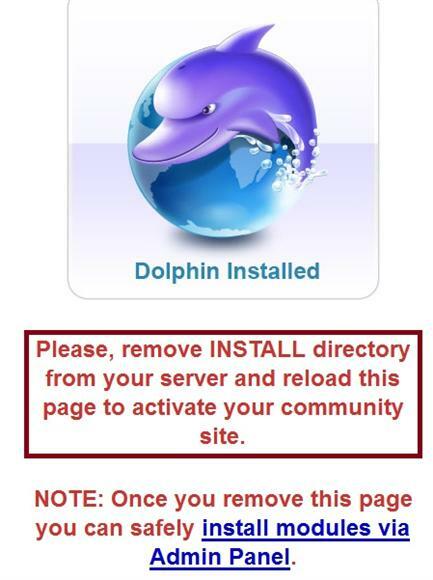 This tutorial will show you how to install Dolphin 7 step by step quick and easy. It is tailored to those that have cpanel and suphp. The process will be very similar with other setups. You should be able to use this as a guide for other types of hosting and setups, with very slight differences. Suphp has a number of benefits over mod_php (apache handler / dso) server setups or configurations. Not only is suphp more secure than mod_php, but you can install Dolphin in a fraction of the time. Files and folders remain owned by your account name rather than by the server. Folder or directories do not need 777 permissions to upload, and files do not need 666 permissions. In fact, unless you have a very strange or unusual suphp configuration 777 folder or directories are not even allowed. Generally 644 files, and 755 folders/directories are all that is needed with suphp even for writable and uploadable ones. The only file that you will likely need to change permission during installation will be ffmpeg.exe. For suphp you will likely need to set or change ffmpeg.exe to 755 or possibly 705 (755 is the more common). 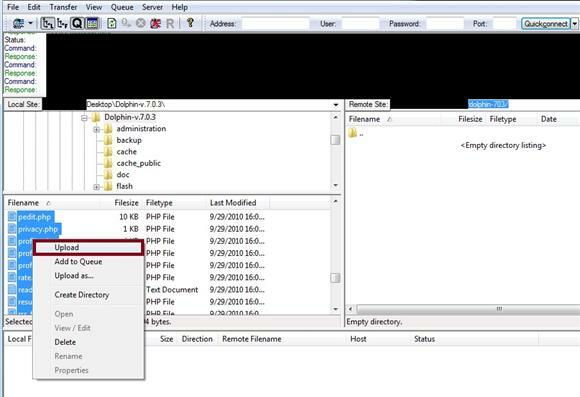 With a mod_php server setup or configuration you will need to change files to writable (666) and folders/directories writable (777) along with executable ffmpeg.exe (777). This alone is a long tedious and time-consuming process. Not to mention creates a lot of security issues. Avoid mod_php server setups especially in a shared hosting environment. With suphp this is virtually eliminated, saving you tons of time. The only exception is ffmpeg.exe will need to be 755 to execute. Which we will see later on in this Dolphin 7 manual install tutorial. The Dolphin installer instructions would seem to be catered to mod_php setups which causes some confusion. For suphp some of the installation instructions can be ignored because it doesn't apply to suphp. If you are not sure if your host uses suphp you can simply ask them. They will gladly tell you. It is a common question and no secret. You should be at least familiar with cpanel and a ftp client such as filezilla (free) to upload all Dolphin 7 files to your hosting account. Before we begin, I will be using a cpanel account name: demo for this tutorial. 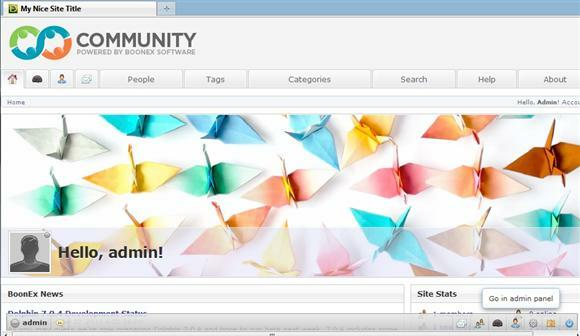 So when I login to cpanel it would be: http://www.mysite.com/demo. Since the cpanel account is: demo, the database name and database username will take the demo name as a sort of prefix followed by an underscore for these. This is common with cpanel hosting, and will need to be used when we get to the Dolphin 7 installer. You must include it otherwise the install will not work and fail. Do not forget the underscore. You would substitute your cpanel login / account name in place of where I use and refer to demo_/demo. 1. First we need to login to cpanel so we can create a new database. 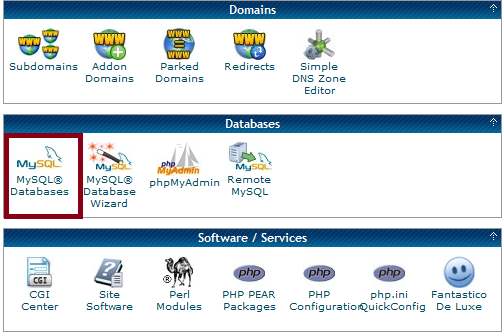 Login to your hosts cpanel and scroll down to the Database section. Select and click on "MySQL Databases". 2. Here, we will find near the top "Create New Database". Enter a name for your new Dolphin database. It is helpful to name it something distinct and easy to remember and identify what it is for. 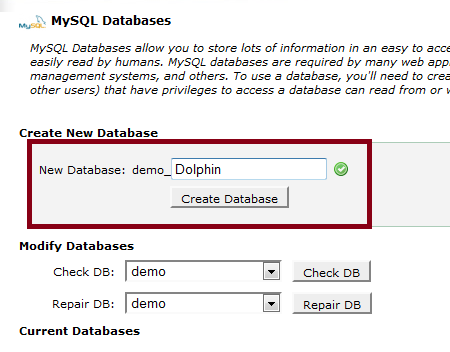 In this example I will name the database "Dolphin" (without the quotes). Then, click the "Create Database" button. The complete database name will then be "demo_Dolphin" without the quotes. The demo part is the name of the actual hosting account. In this case, the cpanel account login and name is demo, so it becomes demo_Dolphin which you can identify easy enough in the screen shot. It is case sensitive. So if you use capitals remember to use them. 3. Create a database user and database password. Now we need to create a database username and password. Return to the "MySQL Databases" page again if you haven't already. Scroll down a little and find the "MySQL Users Add New User" area. Enter a database Username and your desired database password two times. To keep it simple and make the install easier I will use the same username as the database name. Be sure to use a difficult password. A combination of lowercase, uppercase, numbers, hyphens, period, brackets such as ( or ), etc. would help make the password more secure. Do not forget your database password you will need it later on in the Dolphin 7 installer. Then click create database button. The database username in this case will become: "demo_Dolphin" without the quotes again. 4. Add Database User to Database. Next we need to add the database user to the database with all privileges. Return to the "MySQL Databases" page again if you haven't already. 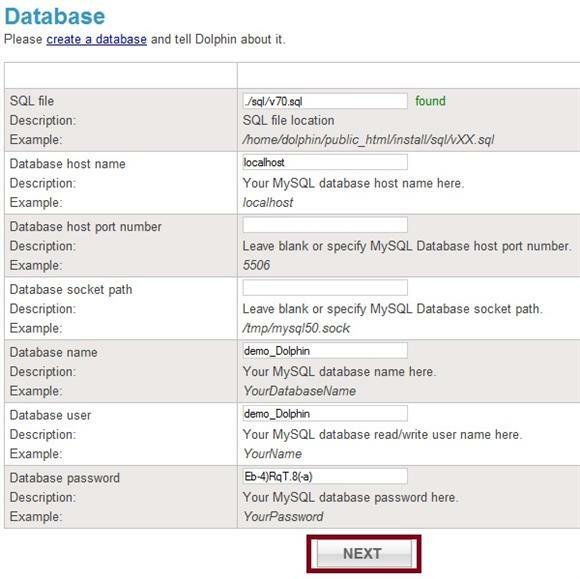 Towards the bottom of the page, select your database username (demo_Dolphin) in the drop down list. Select your database name (demo_Dolphin) in the drop down list. Then click the "Add" button. 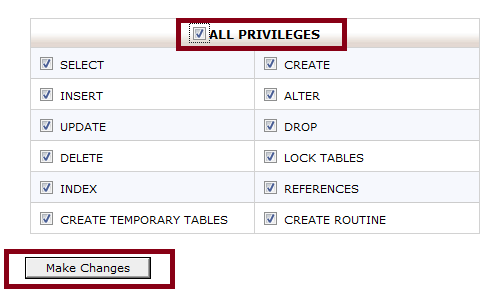 Now tick or select the "All Priviledges" box and click the "Make Changes" button. This takes care of creating a database, database user, and database password in your hosting control panel (cpanel). We need that information to continue and complete the Dolphin 7 installation. Remember the demo part will be your actual cpanel account login or name. If your cpanel login is super, then you would have something like super_Dolphin instead. 5. Download Dolphin 7x version from Boonex. 6. Extract the contents of the .zip file. Extract the contents of the Dolphin .zip file to your computer. The desktop is a good choice and easy to find. 7. Upload the contents of the extracted Dolphin 7 .zip to your desired location at your host. Upload the contents of the extracted .zip file to your desired location in your hosting account. 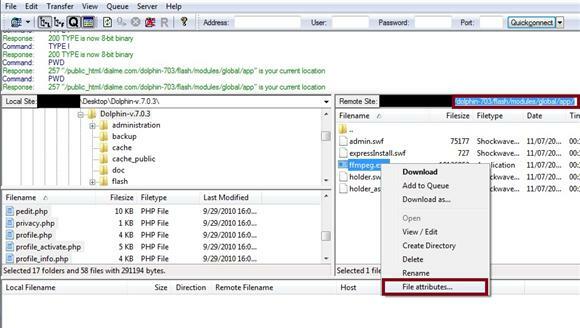 A free ftp client such as filezilla (http://filezilla-project.org/download.php) works great and you can upload the entire contents of the .zip file all at once. In the screen shot files on my local computer are on the left. I select all files and folders, then right click and choose upload. The entire contents of the extracted Dolphin 7 will be uploaded in this case to http://www.dialme.com/dolphin-703 wait for all files and directories to be completely uploaded. 8. Decide if you want your Dolphin 7 site accessible with www's or no www's. Most hosting accounts will allow you to enter your site with www (http://www.yoursite.com) or without the www's (http://yoursite.com). Decide which one you prefer because when you proceed it will determine which one to use and the other will forward or redirected. http://www.yoursite.com (or path to where you uploaded dolphin 7). http://yoursite.com (or path to where you uploaded dolphin 7). I prefer the www's, but that is just me. Some people like them and some do not. It's up to you. 9. The first screen of the Dolphin 7 installer. You should then see the Dolphin 7 installer along with the version you are installing. Click the "Install" button to proceed. The permissions page will include Dolphin 7 file's and folder's permission settings. 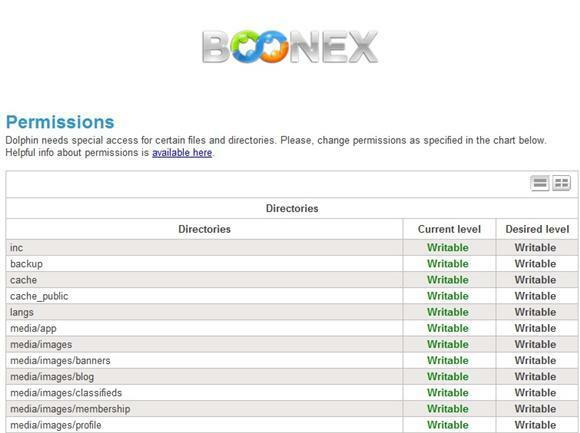 One column is your files and folders current permissions. The other column is the permission level Boonex suggests. If your host has suphp environment most of them will already be green, with the exception of ffmpeg.exe possibly. Even though the file permissions suggest writable (666) and folder/directory writable (777) permissions this is not necessary with suphp setup. 644 files and 755 folders are sufficient. Ignore them with suphp. In fact, a 777 folder permission usually will not work at all with suphp. The only file or directory you will likely need to change a permission on is ffmpeg.exe. With suphp 705 or 755 should be used. Occasionally a 707 can be set on ffmpeg.exe. 755 is the most common. Do not set a 777 permission on ffmpeg.exe with suphp. Click the "Check" button to verify all files and folders are green after making the permission change to ffmpeg.exe. If they are all green click "Next" to proceed. If your host has mod_php (apache handler / dso) you will need to change and set each and every file and folder permission as directed by this page. Click the "Check" button to recheck them before proceeding to the next step. This can take some time be sure you set them as indicated with this type of setup. As you can see the beauty of suphp most files and folders will be green or writable. Which means we don't need to change them, and this saves tons of time when compared to mod_php servers. If you scroll down the permission page you will see that it is red and says Non-Executable. 11. Change ffmpeg.exe permission to 755 for executable for suphp hosting servers. 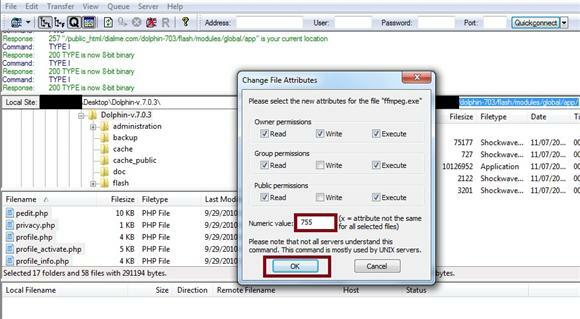 You can use cpanel's file manager to change ffmpeg.exe permission or filezilla. I will use filezilla because I think it is faster. Find ffmpeg.exe in the list on the right side. Then, right click on ffmpeg.exe and choose "File Attributes". 12. Set - change the Numeric value to 755 and click the "OK" button. 13. Check - Re-Check ffmpeg.exe in Dolphin installer. Now check to make sure that ffmpeg.exe is executable. Scroll to the bottom of the page and click on the "Check" button. 14. Ffmpeg.exe updated and executable. Ffmpeg.exe should now be green and executable. If so click the "Next" button to continue. This next page should be filled out for you automatically. You might see a red "not found" after php binary, mogrify, convert, and composite depending on your hosts configuration and setup. This often happens with a mod_php server configuration. Generally you can ignore the "not found"
GD library installed should be green. Do not worry too much about a red "not found" in most cases just click "Next" button. On this page the SQL file should be filled out and have a green "found" after it. Database host port number can usually be left blank with cpanel hosting. Database socket path is also usually left blank with cpanel hosting. Site Description: Enter a description here for your site. -Note: You can change these later in your Administration panel. Click "Next" button to continue. 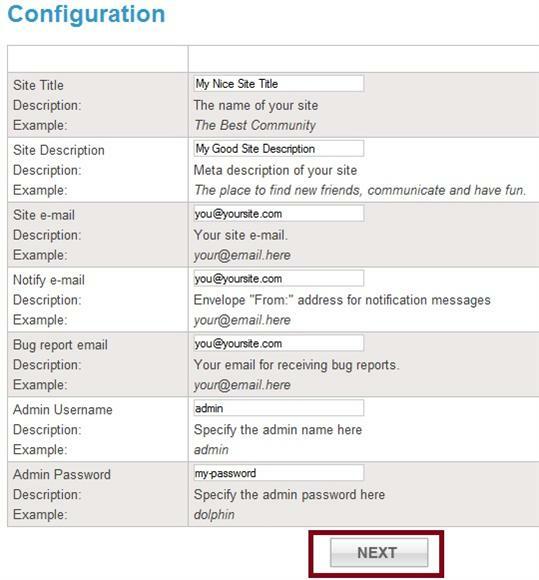 Site email, notify email, and bug report email address tend to work better if you use an email address associated with your domain name (you@yoursite.com). Some of the free email providers such as: gmail, yahoo, hotmail, etc. sometimes do not work with certain setups. For the best luck and results use an email associated with your domain. You can accomplish this by creating an email address in your hosts cpanel. 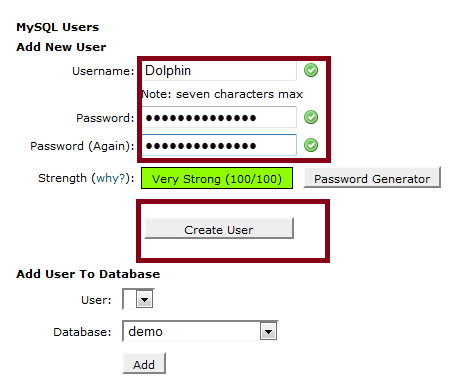 Admin username and password is what you will use to login to your Dolphin 7 Administration area. It will also create a user for the front end with that name too. So choose your Admin name wisely. Use a difficult hard to guess password. You might want to write them down so you do not forget how to log into your administration area before proceeding. Now you will see the cron job Dolphin will tell you to create. We will add the cron in our hosts cpanel now, but you might copy and paste it into something like notepad or wordpad just in case. We will not be concerned with the mail to part as it will already be set in our hosts cpanel cron job area. If you are not logged into your hosts cpanel do so now. 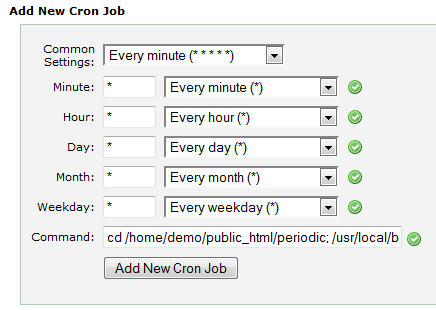 Be sure you leave the cron jobs installer window or tab open yet. Open a new tab or browser window if necessary to login to your hosts cpanel again. Then, scroll down until you find the "Advanced" area and click on "Cron Jobs"
Command: copy and paste the command into this box from step 12 above. Then Click "Add New Cron Job"
Go back to the Dolphin 7 Installer that should still have the "Cron Jobs" information open. 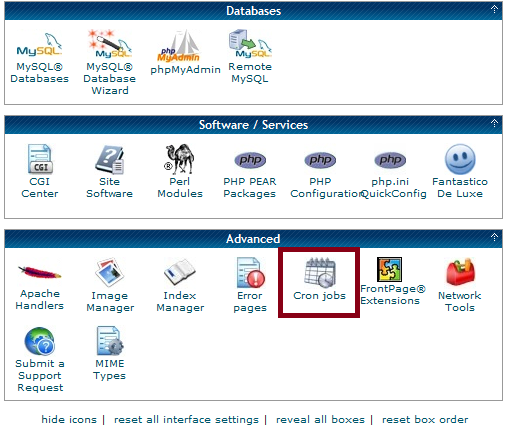 Since we just setup the cron job in our hosts cpanel, we are done with that part and can click the "Next" button now. This is where the confusing part comes in. For suphp hosting it doesn't matter if the /inc directory is writable - red warning. You just ignore it and choose Skip. The /inc directory is owned by your hosting account with suphp, which is why it doesn't matter or hurt any that it is writable. In fact, you probably won't be able to make it Non-writable (read only) with suphp. If you have suphp do not worry about this step. You can just click on "Skip". Any files, directories, or folders showing red are owned by your account and do not matter. Click "skip" to continue with suphp. 644 files and 755 directory/folders once again are all that is needed with suphp, even though you see red disregard it. They are for mod_php (apache handler/dso) server setups. 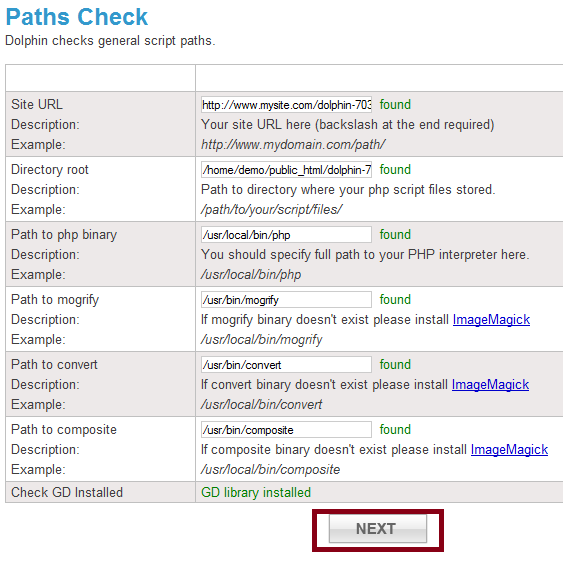 *If you have mod_php, then you will have to set the permissions as indicated. Now you will see Dolphin 7 has been installed and all we need to do is remove the /install directory. 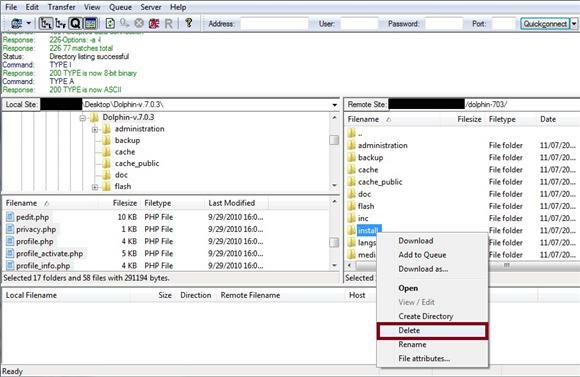 You can delete the /install directory with cpanel's file manager or filezilla. Since filezilla is faster and I already have it open I will use it. Simply navigate to where you uploaded Dolphin to in filezilla. Then, find install on the right side. Right click on the install directory or folder and select delete. 24. Reload or Refresh the Dolphin Installed page. Simply refresh or reload the screen or page we saw in step 22 above. Now there is your brand new freshly installed Dolphin 7 web site. You should automatically be logged in as the admin. You can go to the Dolphin Administration area by clicking the little crown looking icon in the lower right. It will take you directly to the Dolphin 7 Administration Panel or Dashboard. You can log back into your site through your main page just like a regular member would do with your admin username and admin password you entered in step 17 above. Then, click on the crown looking icon again. (where sub-directory would be the name of the directory or folder you might have uploaded and installed Dolphin 7 to). And again use the login details you entered in step 17 above. Then, if you haven't entered a license key you can do so on this screen. Whether free or paid license you can enter either here and click on "Register". Once you enter a license you will no longer see this screen. 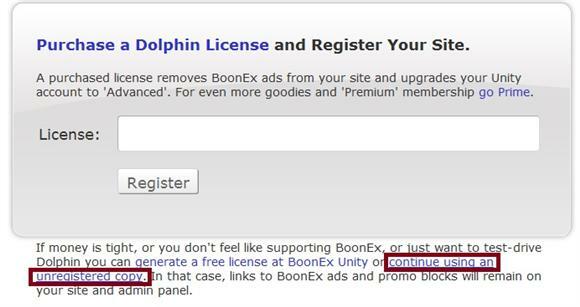 If you do not have one yet, or do not want to enter it yet you can just click on the "continue using a unregistered copy" link to enter your Dolphin 7 Administration area without a license. 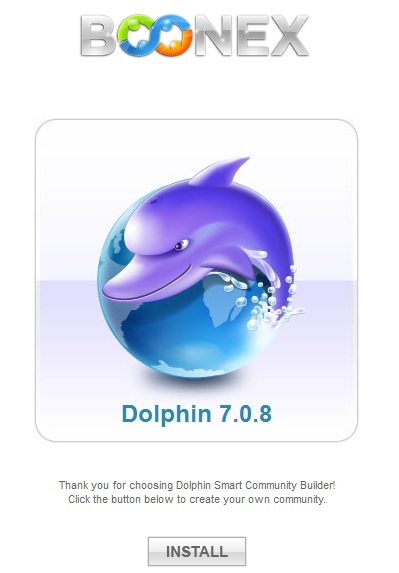 Now start playing with your newly installed Dolphin 7 web site! If you messed up somewhere or somehow review these steps and screen shots again. If you need to start over it is usually best to delete the database from within your hosts cpanel "MySQL Databases" completely and start all over by making or creating a new one. If your host does have suphp consider yourself lucky when compared to mod_php (apache handler/dso). You will not need to change a bunch of file and folder permissions. The only exception might be ffmpeg.exe file. You can install Dolphin in a matter of minutes with suphp when compared to mod_php server configuration. And suphp is more secure than mod_php. Files and directories/folders will remain owned by your account name rather than by the server. Folders do not need to be 777 to upload. 755 is sufficient, and most likely 777 will not work at all on suphp. This alone eliminates a huge security issue that is apparent with mod_php. Suphp is slightly slower, but the enhanced security more than makes up for it. If your host has suphp, along with a good optimized php and mysql configuration it can be very nearly as fast as any other server configuration. This providing your host doesn't put too many accounts on the server. Suphp is a much better choice when compared to mod_php setup in a shared hosting environment. Fast-cgi would be a great choice too. Mod_php might be acceptable if you have a vps or dedicated server and the only accounts on the server belong to you. Mod_php server setup or configuration is not a good choice in shared hosting environment. It would be worth asking a host about before hand, and avoid mod_php hosting if possible. Some hosts on the dolphin hosting page have mod_php, some have cgi (suphp), and others have fast-cgi.